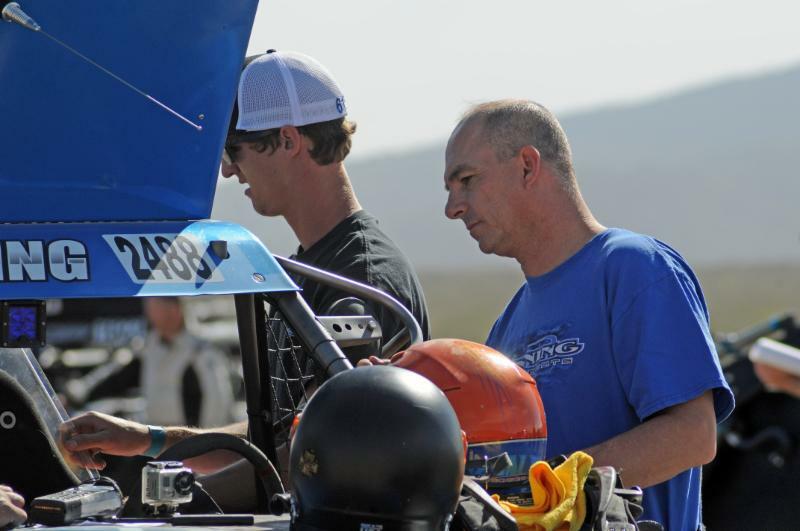 Phoenix, AZ (May 11, 2015)– Banning Motorsports have been faced with some rough races this season, but the Best In The Desert Silver State 300 has proven to be the most difficult by far for the team. A race that runs through beautiful Nevada scenery. didn’t end so beautifully for the Arizona based team. The team would arrive to Las Vegas, NV early on in the week as they had to qualify the #6155 truck for their starting position for race day. Not having the quickest qualifying run, Banning Sr. would be starting the race 14th Class 6100 off the line. 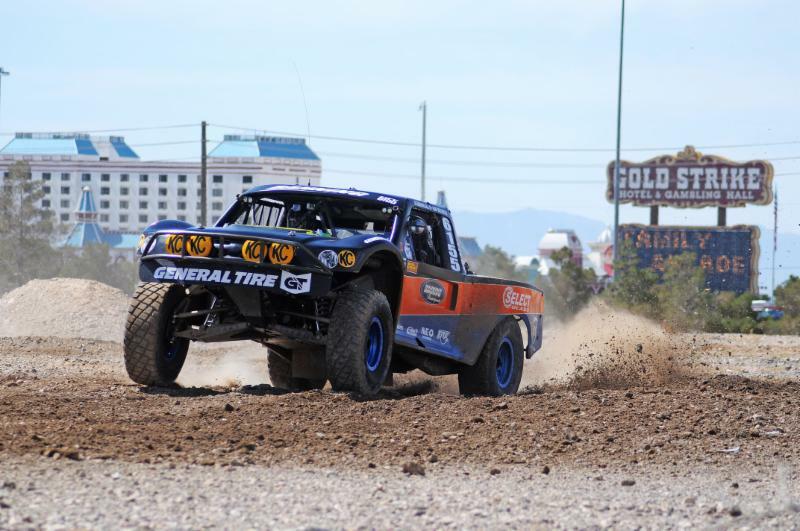 The race started at 9:30am and would only take the Trick Trucks an estimated 5 hours to complete the 275 mile course. Once off the start line, Banning Sr. and Chris Godfrey immediately faced the dust that hung in the air from the faster vehicles. They had 13 competitors in front of them that they needed to pass and another 7 behind them just waiting to capitalize on any mistake they may make. Banning Sr. was charging hard from behind the wheel and by pit 1 it was reported that they were up to 10th place. By pit 2 they had made up another position just 72 miles into the race. It was looking to be an easy day but just 10 miles up the road the #6155 would battle for another position when they would be blinded by the dust and clip a rock that would cause them to roll over. The damage to the truck was repairable with time, but with over 2 hours to get the truck back on all 4 wheels the race was already to far gone for the team to continue in the #6155 truck. Banning Motorsports would continue to chase their points lead in the #2488 car with Bryan Folks and Adam Warren starting the race. With a great run through the first 80 miles of the race and staying in first, the #2488 car would find itself on its side at race mile 84. After hitting a big berm in a right hand turn that would stop them from keeping the car upright. After waiting for help to get it back on the wheels, they had lost several positions and were back running the race looking to at least get to the finish. Making it to pit 4 the team did a drivers change and Rick Graf would get behind the wheel with Tim Sullivan in the co-rider seat. Some more clean miles of racing would bring them up to teammates in car 1023 where the Melton team had slid off course and damaged the front end of the car. 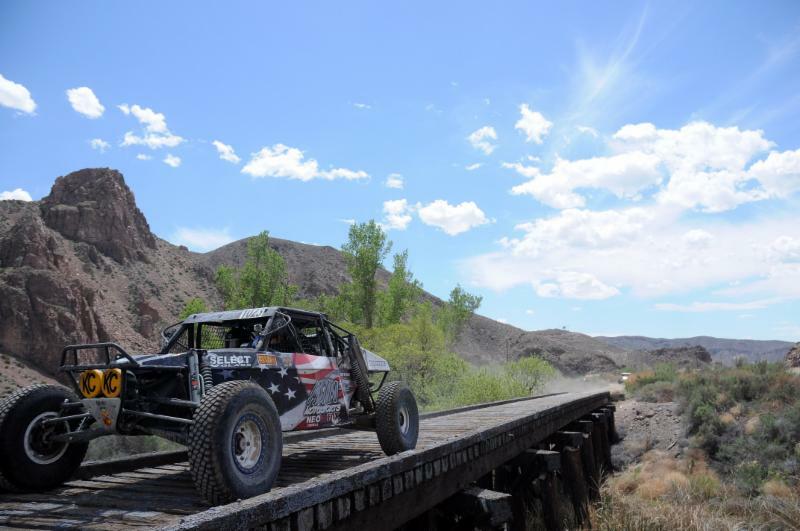 Graf and Sullivan helped the #1023 car back on course and then they continued to the finish line where they would surprise themselves with a 2nd place finish. “Today our team showed that no matter what happens, you have to push to the finish. It was a great day for the team after overcoming the roll overs and other obstacles that were thrown our way.” Said team owner Lee Banning Sr. The Banning Team still supports the #1023 car ran by Melton Motorsports and as the 1023 car started the race, they would mid pack with Steve Melton and Jake Dewitt in the car. Running fast through the dust with minimal issues just major dust. Passing several cars and trucks before arriving at pit 4 would have them around 7th on the road. Quick fuel and a drivers change would have them back on the course quickly. Hayden now behind the wheel and continuing the fast pace up to and thru pit 5. Shortly after pit 5 near rm 180, Hayden clipped a tree on the left side as he was coming down the steep grade. Breaking a lower arm and the steering rack, it took several hours before they were able to get the car so they could limp down the mountain 32 plus miles to pit 6. The chase crew did a quick lower arm swap out and got them back on the road but a short 5 or so miles down course the injured steering rack gave up ending their day. After a hard fought race earlier in the day the team was disappointed but they knows it’s all part of racing. Again the Banning crew did a awesome job supporting all the cars and truck this race giving proof that our teams middle name should be “tough.” A huge thanks to all our loyal crew and partners for everything they do to keep us on course in the desert.